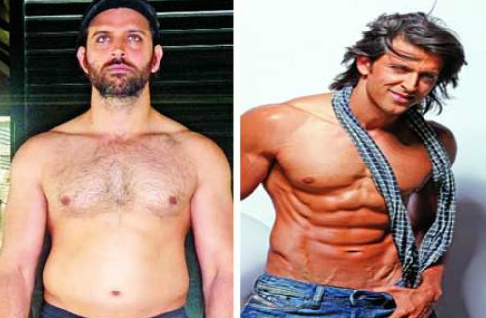 The Bollywood heartthrob Hrithik Roshan, by dint of his exemplary physique, has been the envy of millions. But it is not all about looking good and building rippling muscles – how often do you go out bare bodied in the public? The idea is to ensure fitness and to stay in shape. You would definitely want to have well toned muscles and six pack abs as they essentially reflect masculinity and moreover they do help in enhancing your bodily systems. To build the same, you need to have discipline and dedication to burn the calories and sweat it out. According to the star, the secret to his chiseled physique and athleticism was an urge to stay fit and in shape. Hrithik found it difficult to fit into certain clothes for a particular movie. In this regard, internationally acclaimed fitness expert Kris Gethin had guided him through certain exercises and helped him in adopting certain habitats to develop those wooing curves and contours. If you idolize this person and more importantly his abs, you need to undergo proper training with the perfect balance of exercises and nutrition. Usually, this involves certain training programs which is a continuous process and goes on for weeks together to bring about the desired result. • Don’t bite more than you can chew: Try not to exert too much pressure on yourself by doing strenuous weight training for long hours at the very outset. You can try simple sit-ups by wedging your feet under something heavy and lifting your lower back without bending it. • Crunches: When you are comfortable with the sit-ups you can venture forth to more challenging exercises like crunches where you lie on the floor with arms resting behind your head. Bend your knees and try to raise the upper torso with the help of your abdominal muscles. Avoid lifting the entire back to reduce risks of betting a sprain or cramp. • Leg lifts: These are more challenging whereby you hang from a pull up bar using your hands and try to lift your legs to your chest using your abdominal muscles by bending your knees or keeping them straight according to your capacity. • Static holds: Here, you need to get into a push up position but resting on your elbows and toes and hold your body flat. This trains your abs to a great extent. Try to hold yourself in this position for as long as possible to increase the tensile strength of your abdominal muscles. The six pack abs routine can help you schedule your training sessions. This includes repetitions of the long arm crunch, the reverse crunch, sit ups, the jackknife, and static holds. Twelve repetitions of the above and 45 seconds of static hold would take only ten minutes to complete. So find yourself a certified fitness expert or trainer and get busy with the workouts to build abs and more importantly a good posture; after all, Rome wasn’t built in a day! Work out on a routine basis under the guidance of a fitness trainer to build six pack abs and to ensure better physique.